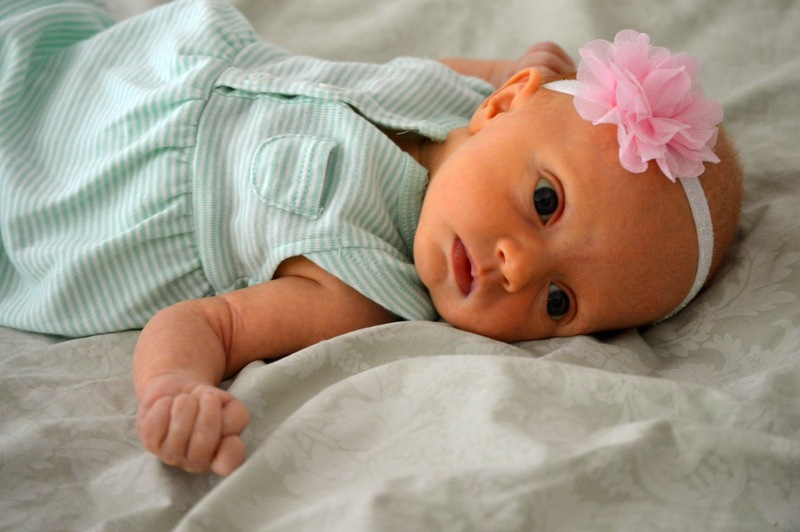 Can anyone recommend me a great newborn photographer in the Provo to Salt Lake area? I need one stat. Pretty soon June isn't even going to look like a newborn anymore and I want a real photographer to get some good pics of her. Today was a weird Sunday. 3) Earlier this week the teachers of the 9 year olds asked if we could teach their class as well. We stupidly said yes. That left me by my lonesome to teach twelve (TWELVE!) squirrely kids and a newborn about David and Goliath. I got up up early (8:30- I realize "early" is a very relative term but come on, it's Sunday AND I'm on maternity leave) to get ready, to get June ready, prepare the lesson, and make treats. A few months ago we started the terrible tradition of bringing treats for the little schmoozers. Now they throw huge fits if we ever "forget". We never should have gone down that dark road of giving food to kids, I realize that, but now if we don't come bearing brownies they're going to stage a revolt, I swear. ANYWAY, everything was going great this morning, (and by that I mean I successfully took a shower,) until we hit a major roadblock. Okay fine. The road block was me. I can't be blamed, it's what happens anytime I'm left alone with my baby. I go ape with the camera. Greg leaves for an hour and I swear, I go all beauty pageant mom on June, staging photos, dressing her up, posing her like a doll, demanding royalties, the likes. It's a mess. I know in the deep recesses of my brain that I am acting totally batty when I take 226 pictures of my daughter just chilling on a Sunday morning, but I have accepted and embraced my battiness and I have to tell you, it feels great. Long live crazy moms! Moving onward. The David and Goliath lesson did not go off at all like I had hoped- when you have 12 kids packed in a little room at 2:00 on a hot Sunday afternoon, I guess you can just expect that they are all going to have WAY too much energy to listen to bible tales. I asked for volunteers to act out the story while I read it out loud from the scriptures. That was a total disaster. My Goliath kept going off script, quoting lines from Despicable Me instead, and my David just kept staring at June, exclaiming, "She's so cute!" "Sarah!" I demanded, "You're David! David can't get distracted by a baby! You got a giant to fight!" To which she threw her hands up in the air and proclaimed, "I give up! It's too hard!" Half of the kids watching in their seats looked bored to tears while the other half we're trying their darndest to get their own speaking part, jumping in their seats and ad libbing their own lines. One kid rolled his eyes and listened to his iPod. It was a mess, people. Add to this all, my little June bug, fast asleep and farting in the corner every ten minutes, sending the entire room of ten year olds into hysterics. Admit it, you would have laughed too. By the time I got home from church it was all I could do to microwave some nachos and veg out on a couple of episodes of Shark Tank. Greg got home about 7:00, reporting that he had mostly sat around and eaten treats all day. It's a tough life, being in commercials. I tried not to be mad. The good news is that he should get a decent paycheck for his day. I already informed him that when the money comes, I am cashing it and spending it all on myself. As far as I see it, I earned every last penny of that check today. You most certainly did earn that paycheck of his. Enjoy spending it. Hope you have a great day! Hahaha! At least you got a good story out of it :) June is too adorable! I see absolutely nothing wrong with taking 226 pictures of your newborn. At least you'll have lots of pictures to look back on (: Keep on keepin' on. Twelve kids, that is a challenge! The part about June made me giggle though. ..."my little June bug, fast asleep and farting in the corner every ten minutes, sending the entire room of ten year olds into hysterics. Admit it, you would have laughed too." haha.... yes, I would have laughed ~ I laughed reading it!! June Bug is soooo adorable. Ah, how I miss Primary! I laugh at all farting. I would giggle endlessly at an angelic baby farting while asleep. Ha! I literally laughed out loud at the thought of June farting in a room full of ten year olds! Look into Fotofly... They're located just off the freeway in Draper. They do some really cute shots, they're really easy to work with, and the quality is amazing. They're prices are really fair too. For like $80 you can get a cd with all the pictures on it and then you can also have pictures printed there too. This made me laugh… going to church by yourself with the kids is THE WORST… let alone trying to teach a lesson! And it is hilarious when babies fart in church. It just is. Has she "filled her drawers" yet in church? That is also funny. My friend Brianna is a wonderful photographer! She lives in Provo, but does shoots all over the state. You should check and see if she has an opening. Her blog is Briannanicholephotography.com. I'm sure she'd love to meet your little June Bug. You're allowed to go ape with the camera. She's the most precious thing ever. Tabulousphotography.blogspot.com. She does so well with newborns. I think she's in West Jordan? Love your posts! You should definitely check out my friend, Kimber. She is amazing with newborns. You can check out her Facebook page or her blog here: http://photobykimber.blogspot.com/2013/01/newborn-pricing.html. Finally playing catch up on reading blogs and this just made me laugh!! I can only imagine all of the excitement that you had to endure with those kiddos. You totally deserve that paycheck!